Here we are in the first week of June, and our May provided fantastic fishing! Lots of big walleyes caught…many in the protected slot so released to grow and reproduce in this amazing fishery. Several keepers, both over and under the slot, have provided food for a fish fry. They are also catching lots of nice pike and some jumbo perch. All of the fish seem fat and healthy. Gunnar took Susie out this week, and they caught close to 30 fish! The water has warmed up quickly, and it seems that the bite is starting to turn to lindy rigs. Come on up for some big time fun on the water! 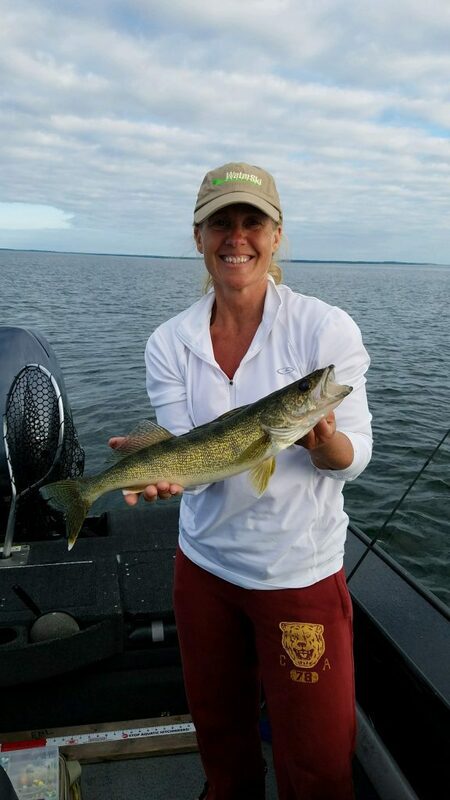 Susie with a nice walleye.